Tangy, fresh and easy to digest, you can't go wrong with all the healthy ingredients in this salad! Here I added a cubed turnip to the mix, which I steamed together with the vegetables. Steam the green beans and asparagus until tender, 5 to 10 minutes, then rinse under cold water. Drain. Steam onion until just wilted, a few minutes. In a small pan, heat the pine nuts over medium heat until lightly browned and fragrant. 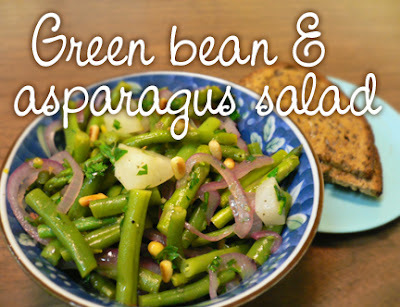 In a large bowl, place the green beans, asparagus, onion and parsley, and toss with the lemon juice, grated rind, olive oil, nuts and tarragon. Season with a bit of salt and plent of fresh ground black pepper and top with pine nuts. Makes a hearty side salad for two. lovely recipe....I am going to make this once the weather gets a bit warmer here in NL! reduced a bit the lemon and parsley. tasty, fresh. yum!